It has been 2 1/2 weeks since our first garden plants went into their new home in our garden, and sadly, many of them have perished since these photos were taken. 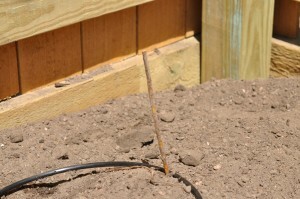 The seedlings my boys and I lovingly planted and watered and hardened off went into the ground the second week of May. The next three days it rained, the wind blew, hail fell, and the plants, unprotected by various garden coverings with which it would have been wise to cover them, croaked. 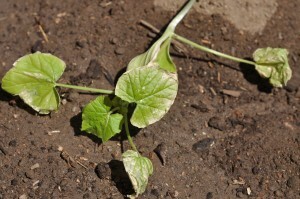 Apparently my tough love approach to gardening wherein the hardiest plants should have weathered the elements and lived on stronger to produce lots of wonderful vegetables and fruit for my family… is just not a wise approach. On days 4 through 11 I watched the weather-beaten plants for signs of life as it continued to rain with very little sun, hitting the 40’s at night. On day 12 I bought new plants from the local farmers market, abandoning my “introduce a few new varieties at a time and see how they do” approach, and coming home with tomatillo, red and yellow bell peppers, an indeterminate tomato hybrid, a roma tomato, zucchini seeds, and cilantro seeds. 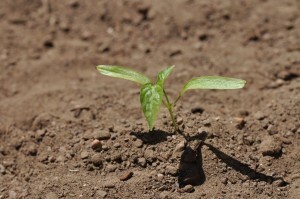 Don’t start seedlings again without letting them grow thicker and hardier first, which means either building a greenhouse or rigging some sort of UV lighting stuff in the basement, plus bigger pots, and who knows what else. I may not start seeds again soon. Wait until maybe Memorial Day to plant anything out there. 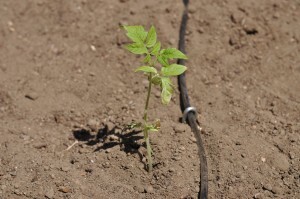 Follow local tomato planting guidelines, including walls-0′-water and planting horizontally so only leaves are exposed. 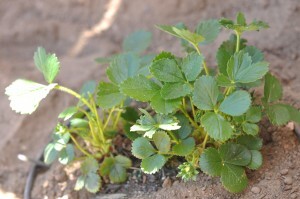 Here are some photos, some of commemorative nature..
First, our strawberry plants, which my youngest has claimed as his own, and which are already producing fruit, having weathered the elements with style, and which we are pleased to learn will come back next season. Cilantro, looking rather peaked. New seeds were sown right next to these now dead plants. They are supposed to be hardy early season growers here. Not these ones, though. This is a raspberry bush from a national hardware store. Having seen what is at the farmers’ market labeled raspberries, I’m sorry we even planted these sticks, and am watching them without much hope for success. I saved my receipt. 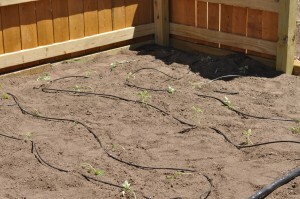 The northwest corner of the garden, filled with jalapenos and zucchini, right before watering them in. Too bad none of them made it. Poor little guys, and they looked so healthy, too. These are purchased tomato plants, and some of them are mysteriously bearing yellow leaves now, which google says means lack of nitrogen or not enough sun or water. 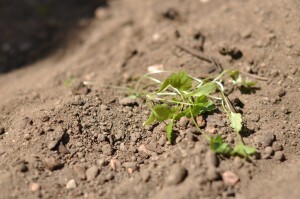 We’ve had very little sun, lots of rain, and they went into compost-rich soil. Watching and waiting on that one. Not sure, but they are hanging in there and I see little tomatoes on one..
..and roma tomato. Were I to do it again, this would have gone in horizontally without so much stem exposed to whip around in the wind. They still got quite a bit of the crazy wind despite the completely walled garden. 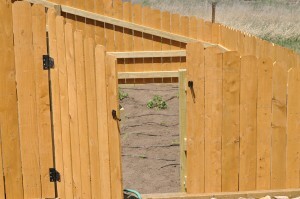 Through the garden gate, with irrigation system and graduated fenceline. Left side is windward. Be sure to check out the Homeschool Village Garden Challenge linkup for lots of gardening progress with curriculum to match. 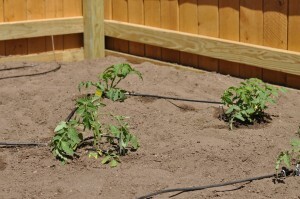 And please, by all means, if you know what is causing my tomato plants to turn yellow- leave a comment and let me know! Are you familiar with Sword Drills? These are a fun way to learn the Bible, usually referencing a particular topic, in this case, trees! Students rapidly look up verses, and it can be done as a contest (with instructions here) or not. Here are some verses pertinent to our tree study. Enjoy!